It was Spring 1980 in Havana. Before dawn a group of policemen hurriedly entered the cells of the Eastern Consolidated prison, known as the “pizzeria.” After lining the inmates up, their backs to the wall along a narrow corridor, an official of the Ministry of Interior spoke in a loud voice and without beating around the bush. He was blunt. “You can get on a bus that’s waiting outside and leave for the United States, or within three days your prison sentences will be doubled. You choose,” he said. “Imagine, I was sentenced to 20 years in prison for murder,” recalls Randolfo, sitting in a park in the Havana neighborhood of La Vibora. “Going to the U.S. was my passport to freedom. “I don’t know if my sins can be purged. I stole, killed and caused harm. Since I was sixteen-years-old, prison had been like home. In January 1980 I was transferred from the prison at La Cabaña to Eastern Consolidated, which was still under construction. Before the incident at the Peruvian embassy, which took place before the stampede at the port of Mariel, I was in a prison cell. I didn’t think twice about leaving,” recalls Randolfo. 1980 was an extraordinary year in Cuba. On April 1, the #79 Lawton-Playa bus, travelling at full speed, smashed through the security barricade at the Peruvian embassy on 5th Avenue and 72nd Street in Miramar. The police crossfire caused the death of one of their comrades, Pedro Ortiz Cabrera, who worked there as a guard. It was a period in which Fidel Castro and his regime were in complete control of civic life. Insincerity and hypocrisy were at their height. Many people energetically applauded his speeches in the Plaza of the Revolution even as they relished leaving the gray, uniform setting in which an all-powerful state rewarded or punished those it governed by edict. The jails were full. Anything could be a punishable offense: having dollars, sailing on a rubber raft to Florida or telling a neighbor you had a dream that Fidel had died. And there were also dangerous guys like Randolfo, individuals with short fuses who moved through life with a knife clenched between their teeth. After Castro’s miscalculation — he never imagined that over ten thousand Cubans would storm the Peruvian embassy within a few hours after his decision to remove police protection — the strategy became one of carrying out a full-scale social cleansing of the country by clogging American society with murderers, the mentally ill and violent criminals. It was a collection of humanity that would have had no place even on Noah’s ark. At a processing center near the Lucero highway south of the capital heading towards Mariel, homosexuals, silent dissidents, prostitutes, rockers and social misfits were hastily dispatched. Castro branded them as “scum” and shipped them off in boats owned by Cubans living in Florida, who came out hoping to find their relatives. Before leaving, eggs, insults and punches were hurled at the “repulsive worms” at Fascist-style rallies in which their neighbors or work colleagues happily participated. Randolfo has a different story. He was transferred from the prison to the processing center and in little more than an hour he was on a boat headed north. In 1987 Randolfo participated in a massive prison riot in the southern state of Georgia. Randolfo’s was one of the 2,746 names that made up a list of people to be repatriated to Cuba after agreements reached between Ronald Reagan and Fidel Castro in 1984. “I landed at a Havana airport in night in late 1990. They took off the handcuffs and handed me over to the Cuban guards, who put handcuffs back on and transferred me to Eastern Consolidated. I was a prisoner there for another year. I had not been a free man since 1978. All I knew of the United States was its prisons. I’ve changed. I have a family and my dream is to emigrate to the U.S, to work hard and to get ahead. It’s a society that gives you that opportunity. But my past is holding me back. The U.S. immigration authorities will never give me a visa,” says Randolfo. 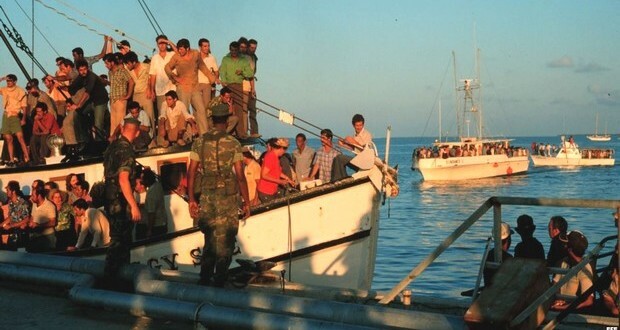 Thirty-four years after events at the Peruvian embassy and the mass exodus through the port of Mariel, U.S. customs and immigration authorities continue to deport criminals and the criminally insane sent over by Fidel Castro in 1980. There are five-hundred and two awaiting repatriation.